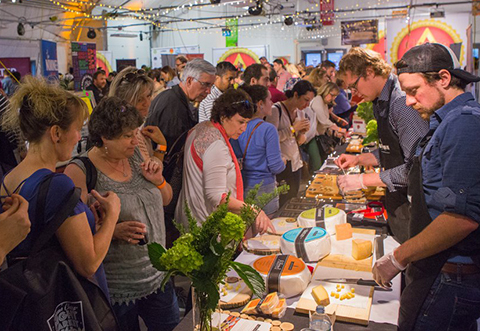 Sunday is Raw Milk Cheese Appreciation Day at #TGCCF. We’re giving away cheese made with unpasteurized milk to draw attention to cheese the way God intended it to be made—all natural, entirely pure, and delicious. Made with raw cow’s milk by Fromagerie du Presbytère, Sainte-Élizabeth de Warwick, Québec, Jean Morin, cheesemaker. Louis d’Or has become a Canadian classic by virtue of its marvelous flavour and countless awards, including Grand Champion at the Canadian Cheese Grand Prix. Made by Bushgarden Farmstead Cheese, Elgin, Ontario, Nigel Smith, cheesemaker. Nauvoo is a traditional cheese made with organic raw cow’s milk produced by a small herd of Holstein and Brown Swiss cows on a fifth-generation, family-run farm in the Rideau Lakes. Made by Best Baa Dairy, Fergus, Ontario, Elisabeth Bzikot, cheesemaker. Eweda Cru is made with raw sheep’s milk using a traditional Gouda recipe and aged for a minimum 9 months. Each cylinder is marked with sheep’s information pertaining to the producer of the milk used, creating traceability and accountability for the quality of each wheel. Made by Back Forty Artisan Cheese, Lanark Highlands, Ontario, Jeff Fenwick, cheesemaker. A distinct feature of Bonnechere is the rind that is toasted over an open flame before aging. This painstaking process, traditional for certain Basque cheeses, imparts a delicious caramel essence which permeates the body of the cheese as it ages, and provides a delicious contrast to the tangy and fruity body of the cheese made with raw sheep’s milk. What’s the big deal about cheese made with raw milk? Raw-milk cheese is all natural, entirely pure, and delicious. It represents the full taste of place—terroir—that comes from the land, the grass and the milk. Raw-milk cheese is not only traditional, it is as old as cheese itself. In fact, until Louis Pasteur came along in the mid-19th century, all milk was raw by default. While it may seem counter-intuitive, microbial organisms are not only responsible for food spoilage they are also fundamental to food preservation. Cheese, like any other fermented food (wine, beer, bread, sauerkraut, to name a few), is a complex interaction between raw ingredients and the ambient microbes in our environment. In reality, very few bacteria are “bad” (i.e. pathogenic) and the good bacteria in cheese ensures that the product remains safe to consume by outcompeting undesirable pathogens. What’s more, there is an expanding body of scientific literature that suggests that food rich in probiotics (i.e. cheese, yogurt, and other fermented foods) are really quite healthy, providing essential vitamins and minerals and potentially helpful with respect to allergies, asthma, and a host of other health concerns. Is raw-milk cheese safe to eat? Yes! In Canada, federal regulations require that cheese made with unpasteurized milk be held in affinage for a minimum of 60 days before it can be sold to the public. That’s the period of time it takes for any pathogens to be naturally eliminated by the aging process. 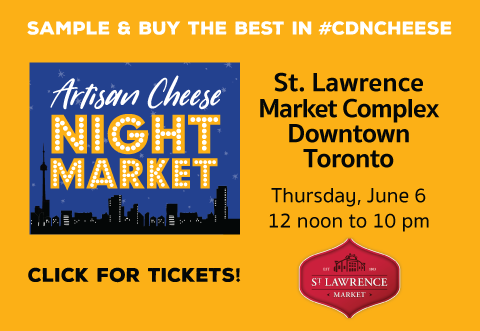 At The Great Canadian Cheese Festival, we are celebrating Raw Milk Cheese Appreciation Day on Sunday, June 4. Internationally, it is celebrated in April. Click here to learn more.